Every June, there's a giant Wilton tent sale, in Woodridge, IL, which is about 30 minutes away from where my parents live. Two years ago I went for the first time and found myself coming home with a bag full of things I didn't know I needed. This year I happened to be in town during the sale and once again, my mom and I found ourselves amongst every Wilton product you could ever imagine. I filled my cart with a bunch of fun things, including a variety of colorful cupcake liners and some new cookie cutters and a cake carrier. The thing I was most excited about, however, were my new cookie sheets! I've had the same cookie sheets since I've been married (over 4 1/2 years) and with all the cookie baking I do, a few of them are in rough shape! I picked up two of the insulated cookie sheets, which I've heard do magic things for your cookies (like prevent the bottoms from burning and kept them all to cook evenly). Needless to say, I was eager to put the new baking sheets to use and these cookies were just the recipe to break them in! 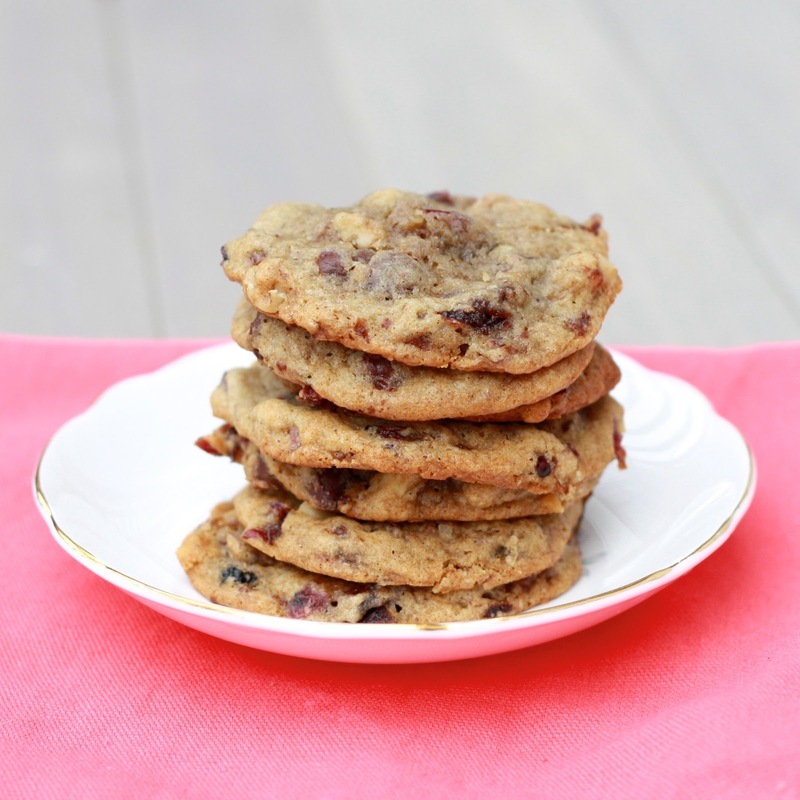 These cookies have a trifecta of goodies happening: dried cherries, walnuts, and chocolate chips, meaning you get a different taste and texture in every bite. The cookie sheets did their job--no burnt bottoms! My cookies came out incredibly flat, but I think that was more the result of the recipe than the baking devices used. I'm excited to experiment more with my new baking pans. How about you? Swear by insulated cookie sheets? Some other kind? 1. Preheat oven to 350F. Line 2 pans with parchment paper. 2. In a large bowl, sift together the flour, baking soda, and salt. Using a small knife, split the vanilla bean lengthwise and scrape the seeds from the pod into a small bowl. 3. Take the vanilla bean pod (not the seeds) and place it in a small bowl. Add 1 cup of boiling water and the dried cherries. Allow to stand for 5 minutes before draining, reserving the cherries and discarding the vanilla bean pod. 4. In the bowl of an electric mixture, beat the butter, sugar, and brown sugar, until light and fluffy, about 2 minutes. Add the egg and the vanilla bean seeds and beat on medium until combined, about 1 minute. With the mixer on low, add the flour mixture in 3 batches, stirring just until combined. 5. 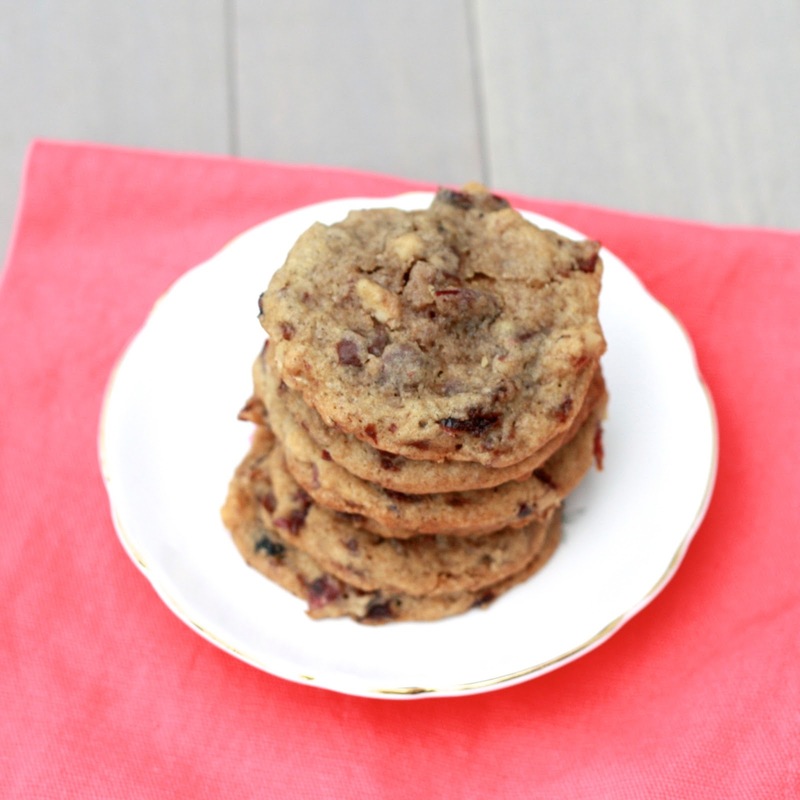 Stir in the cherries, chocolate chips, and walnuts, just until incorporated. 6. Drop tablespoons of dough onto the prepared baking sheets, about 2 inches apart. Bake sheets for 10-12 minutes, until light golden brown and just set. Cool the cookies on baking sheets for 5 minutes before transferring to a wire rack to cool completely. Store cookies in an airtight container at room temperature.